Rich Gordon Scottish bagpiper for weddings and special events Rich is a highly experienced piper and began playing pipes in 1996 Rich has performed at numerous events ranging from weddings to funerals, parties, shop openings and student welcome events at the University of St Andrews. 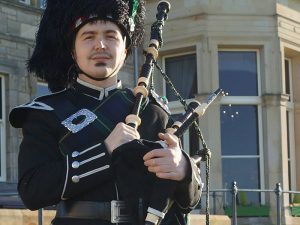 A passionate piper and musician, Rich has steadily grown his piping repertoire to include many piping standards – marches, reels, jigs and strathspeys, and has even begun composing his own piping music. Rich has been playing the Scottish bagpipes for 20 years and has performed at countless events of all sorts. A passionate bagpiper with a large repertoire. He takes a great deal of pride in his performance and strives to deliver the best service he possibly can to all his clients. Whether you need a Wedding Bagpiper, corporate events or private parties in Dundee and Angus, Fife, Perthshire, Glasgow, Edinburgh, Central Scotland, the Scottish Highlands and Aberdeenshire.